"This tasty dish combines the sweetness of roast pumpkin and salty taste of feta cheese to create a sensational risotto." Preheat oven to 400 degrees F (200 degrees C). Brush a baking dish with olive oil. Making roast chicken betta with feta. Superb!! So smooth and creamy yet without any cheese in the risotto!! I added a whole clove of fresh garlic. Will definately make again! This recipe was delicious! I used chicken broth instead of vegetable, and used 6 cups instead of 4. The fresh pumpkin was kind of a pain to work with, but worth it!! Very good flavor and presentation too. 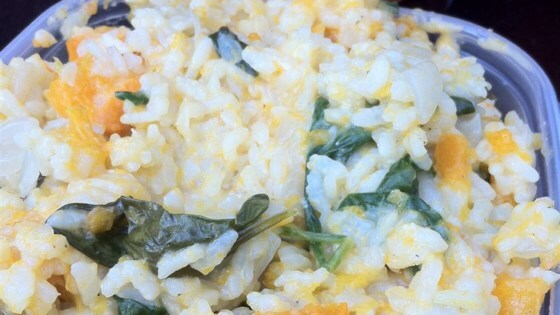 The mashed pumpkin added to the rice makes the dish. I tasted it before adding the pumpkin and it was kind of bland, but afterwards, what a difference!